Due to the second birth, every born again believer truly is a “new creature in Christ”, sealed with the Holy Spirit, possessing a “divine nature” (“new man”) “Christ in you, the hope of glory” (Col. 1:27). However, our old fleshly nature, which is contrary to God, is not eradicated upon salvation…unfortunately, he remains alive and active. The nature of the “new man” is animated by the inworking power of the Holy Spirit, therefore He desires to love, obey and please God. The flesh, at every level, exerts tremendous force on the will; continuously drawing us to disobedience by counteracting the pull of the Holy Spirit. The flesh not only employs temptation through the carnal appetites and fleshly lusts but also supplies an endless list of excuses, constantly seeking to override or neutralize the Holy Spirits influence. When moved by the Spirit to read the scriptures, pray, or worship, the flesh instantly distracts, deflects…reminding us of other things which must be done or better things…more pressing or pleasurable things inclined toward self-satisfaction. 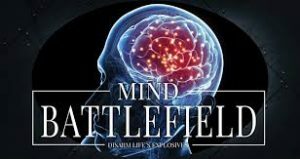 In essence, the battle for control of the being is a tug-of-war between an inborn, well-established nature and an emerging new nature…intense as hand to hand combat, although in this case, the battle is not physical; the mind is the arena of conflict. This is where the battles are won or lost. The following verses provide the Apostle Paul’s personal account of the inner conflict between his old nature (sin-prone flesh) and new nature (indwelling Holy Spirit). This key portion of scripture explains the inner workings of an intense battle between two co-existing, diametrically opposed forces; the inevitable outcome of the second birth. 15 For that which I do I allow not: for what I would, that do I not; but what I hate, that do I. 16 If then I do that which I would not, I consent unto the law that it is good. 17 Now then it is no more I that do it, but sin that dwelleth in me.18 For I know that in me (that is, in my flesh,) dwelleth no good thing: for to will is present with me; but how to perform that which is good I find not. 19 For the good that I would I do not: but the evil which I would not, that I do. 20 Now if I do that I would not, it is no more I that do it, but sin that dwelleth in me. 21 I find then a law, that, when I would do good, evil is present with me. 22 For I delight in the law of God after the inward man: 23 But I see another law in my members, warring against the law of my mind, and bringing me into captivity to the law of sin which is in my members. 24 O wretched man that I am! who shall deliver me from the body of this death? 25 I thank God through Jesus Christ our Lord. So then with the mind I myself serve the law of God; but with the flesh the law of sin. (Rom. 7:15-25). In the above verses, the Apostle Paul expresses his frustration with his inability to totally abstain from sin. He has a sincere desire to please God yet he finds it impossible to do so in the power of his flesh. No matter how hard he tries he inevitably fails: his self-will and determination are wholly insufficient. “For I delight in the law of God after the inward man: 23 But I see another law in my members, warring against the law of my mind, and bringing me into captivity to the law of sin which is in my members. The realization that “Now then it is no more I that do it, but sin that dwelleth in me.18 For I know that in me (that is, in my flesh,) dwelleth no good thing…” is a wonderful liberating truth. Humbly acknowledging our inability is the key to subduing the old nature; ironically the battle is won by surrender. Jesus said “the flesh profiteth nothing…” (John 6:63). Walking in the flesh is to be controlled by our carnal appetites, ruled by our circumstances. It is to be motivated by “old man” ceding to the old nature, reacting to our emotions, relying on our abilities and intellect rather than the indwelling Holy Spirit. “For we are the circumcision, which worship God in the spirit, and rejoice in Christ Jesus, and have no confidence in the flesh.” (Phip. 3:3). As was previously discussed every true “born-again believer has two wells to draw from. Two contrary reservoirs of influence which shape and determine thought life; one inherited from Adam the other implanted by God upon salvation; two hearts, two minds resulting in two opposing wills. The necessity of comprehending both the source and nature of the two diametrically opposed forces responsible for the incessant inner struggle is of paramount importance. The spiritual condition of our hearts is in direct proportion to our resistance to the flesh (through God’s power in us), it is, therefore, crucial that we fully understand the nature of the enemy within. Learning to feed the “new man” while starving the “old man”, although essential, is only half the battle. Putting on the whole armour of God also involves understanding the mechanics (energy and forces) behind the warfare “Lest Satan should get an advantage of us: for we are not ignorant of his devices.” (2 Cor.2:11). The way we live is closely related to our inner state. “Keep thy heart with all diligence; for out of it are the issues of life.” (Prov. 4:23). It is important on many levels to understand how the inner man shapes the outer man. 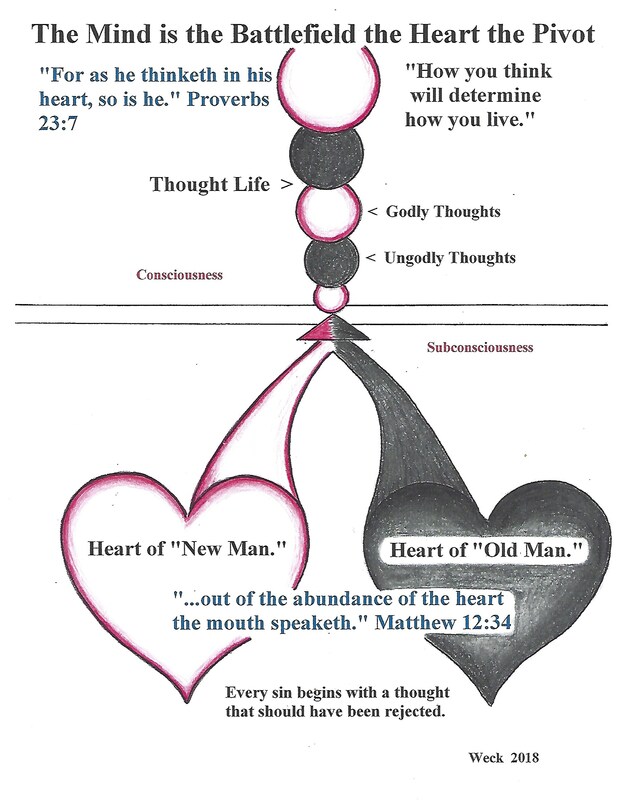 The following illustration depicts the heart of the problem; the two fountains responsible for our thought life. 18 And he saith unto them, Are ye so without understanding also? Do ye not perceive, that whatsoever thing from without entereth into the man, it cannot defile him; 19 Because it entereth not into his heart, but into the belly, and goeth out into the draught, purging all meats? 20 And he said, That which cometh out of the man, that defileth the man. 21 For from within, out of the heart of men, proceed evil thoughts, adulteries, fornications, murders,22 Thefts, covetousness, wickedness, deceit, lasciviousness, an evil eye, blasphemy, pride, foolishness: 23 All these evil things come from within, and defile the man. “And he said unto them, Why are ye troubled? and why do thoughts arise in your hearts.” (Luke 24:38). “Therefore if any man be in Christ, he is a new creature: old things are passed away; behold all things are become new.” (2 Cor. 5:17) “…Christ in you, the hope of glory…” (Col. 1:27b) “And because ye are sons, God hath sent forth the Spirit of his son into your hearts, crying, Abba, Father.” (Gal.4:6) Obviously, it is impossible for the “new man” and the “old man” to peacefully coexist; hence the incessant mental tug-of-war. “Wherefore gird up the loins of your mind…” (1 Peter 1:13) the analogy put forth in this verse provides valuable insight regarding the essential defense of the mind. The key word is “loins” which means the vital parts of the body, major organs which were protected in battle. A wound in this critical region was almost always fatal. “ For though we walk in the flesh, we do not war after the flesh: (For the weapons of our warfare are not carnal, but mighty through God to the pulling down of strong holds;) Casting down imaginations and every high thing that exhalteth itself against the knowledge of God, and bringing into captivity every thought to the obedience of Christ…” (2 Cor. 10:3-5). Notice the warlike terminology used by the Holy Spirit in these highly instructive verses; war, weapons, warfare, casting down, and captivity. Strongholds: Prior to salvation we lived, “according to the course of this world, according to the prince of the power of the air, the spirit that now worketh in the children of disobedience…” (Eph.2:2). During that time the insidious influence of an ungodly society had thoroughly indoctrinated our way of thinking…conforming us to “this present evil world.” Over time, through repeated exposure, thought patterns were formed and a worldview established. The Bible refers to these carry over captive areas of the mind, held by the devil and strongly defended, as “strongholds.” These well-founded worldly attitudes are contrary to the teachings of the word of God and unless “pulled down” will add much resistance to spiritual growth. As new creatures in Christ, we are clearly warned by the word of God, not to be, “conformed to this world” (Rom.12:2). Imaginations: The LORD hates “An heart that devises wicked imaginations… ”(Prov.6:18). The word “imaginations” is mentioned 6 times in the scriptures and always carries a negative connotation. Consider (1 Chron.28:9, Prov. 6:18, Lam. 3:60-61, Rom.1:21, 2 Cor.10:5). Imaginations: The ability to form a mental image of something not actually present to the physical senses…mind pictures. Imaginations can be defined as spontaneous thoughts and mental images projected from the sub-conscious; stored thoughts and images which primarily arise from the sinful heart of the “old man.” Fantasize… the sensuous free play of man’s sin nature. The first mention of “imagination” “And GOD saw that the wickedness of man was great in the earth, and that every imagination of the thoughts of his heart was only evil continually.” (Gen.6:5). Fallen man is “a transgressor from the womb…” (Isa.48:8), “…for the imagination of man’s heart is evil from his youth…” (Gen.8:21). It is vital to the Christian’s spiritual welfare (and usefulness to the Lord) that he or she learns to discern “…refuse the evil and choose the good…” (Isa.7:15). There are two types of wisdom in the world. One is born of Light the other of darkness; one is from above the other from below. The new man is animated by the wisdom from above; the old man by the wisdom from that is from below. Spiritual growth depends on discernment and choice. The first challenge is to discern between the two types of wisdom. The second challenge is to choose between the two. “That ye put off concerning the former conversation [manner of living] the old man, which is corrupt according to the deceitful lusts; And be renewed in the spirit of your mind; And that ye put on the new man, which after God is created in righteousness and true holiness.” (Eph.4:22-24). This putting off or yielding, initiates an essential lifelong process whereby changed people learn to live changed lives; a gradual transformation which causes that which happened on the inside to become evident on the outside “Christ be formed in you…” (Gal.4:19). No matter hard you try you cannot serve God in the flesh “the flesh profiteth nothing…” (John 6:63). Inconsistency is the enemy of spirituality; in order to consistently guard our hearts and overcome our enemies, we must beseech the Lord to supply the spiritual wisdom and necessary grace to live a life pleasing to Him. “Ask and it shall be given you…” (Matt.7:1). In order to guard our hearts, we must control our eyes. The eye gate is the primary entrance to the mind. Eighty-nine percent of what we learn comes through visual stimulation, ten percent through audible stimulation, and one percent through the other three senses. Therefore the eye gate is of foremost concern and must be strictly guarded. Must guard your heart by learning to recognize and “abstain from all appearance of evil.” Avoid that which provokes negative stimulation…identify and shun your susceptibilities’ (areas of weakness); those things to which you have little resistance. “But put ye on the Lord Jesus Christ, and make not provision for the flesh, to fulfil the lusts thereof.” (Rom. 13:14). Acknowledging and shunning our vulnerabilities goes a long way to guard our hearts. “ For though we walk in the flesh, we do not war after the flesh: (For the weapons of our warfare are not carnal, but mighty through God to the pulling down of strong holds;) Casting down imaginations and every high thing that exhalteth itself against the knowledge of God, and bringing into captivity every thought to the obedience of Christ…” (2 Cor. 10:3-5).